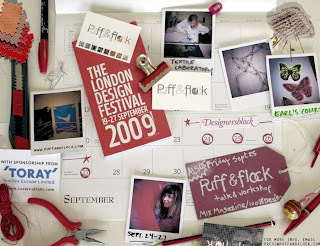 Come and check out new works by future textile collective Puff & Flock will be exhibiting at Designersblock for this years London Design Festival. Puff & Flock are also part of the Mix magazine seminar program at 100% Design, both taking place at Earls Court, 24th - 27th September. Don't forget to register for both tickets and visit it Puff & Flock in stand B20 for inflatable wonders, magnetic magic and glowing fabrics set amongst the Puff & Flock hub of textile dreams and inspiration. can anyone here help me with the address of proffessional flockers in london? I need to get some jewellery flocked... Please help! Unfortuantely I don't know any but I am sure you would have find in the mid-time. The primary purpose of this blog is to generate discussions about textile design practice-based research rather than focusing on problem-sovling as such. Good luck.